Nestled at the edge of Jasper National Park, the Wyndswept is surrounded by deep forests and the soaring Rocky Mountains. Quiet and rural, this is an ideal spot to enjoy the pristine natural beauty, go hiking or skiing and enjoy the incredible views. Suites are decorated in a variety of themes. Two suites are available one with a kitchen, king or queen both have private baths. 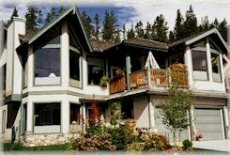 Surrounded by the spectacular Canadian Rockies, An Eagle's View Bed & Breakfast is the perfect place to be. An Eagle's View B&B is located just five minutes from the Banff National Park gate, in Canmore, Alberta. From here, you can enjoy a variety of mountain trails, ranging from leisurely walks to challenging hikes, or take day trips to surrounding attractions such as Banff, Lake Louise, and the Kananaskis Country. In Calgary bed and breakfast means a night at Twin Gables. Built in 1910 this Inner City Historic B&B Home maintains the romance of a bygone age. Fully restored, the elegance and richness of the past is alive with leaded stained glass windows, hardwood floors, tiffany lamps, pocket doors and antique furnishings. Delightful Bed and Breakfast accommodations. Twin Gables Bed and Breakfast in Calgary gives you your private entrance to gracious suites, tastefully decorated and functional for today's lifestyle. In Calgary bed and breakfast means a night at Twin Gables. Built in 1910 this Inner City Historic B&B Home maintains the romance of a bygone age. Fully restored, the elegance and richness of the past is alive with leaded stained glass windows, hardwood floors, tiffany lamps, pocket doors and antique furnishings. Delightful Bed and Breakfast accommodations. Twin Gables Bed and Breakfast in Calgary gives you your private entrance to gracious suites, tastefully decorated and functional for today's lifestyle. Great Calgary shopping & fine dining located just 3 minutes away on trendy 4th Street. Close to: Downtown Business Center, Telus Convention Center, Calgary Stampede Grounds. Twin Gables is 20 minutes from the airport, 75 minutes to Banff and the Rocky Mountains.